As anyone who’s spent much time around the Mozilla community knows, t-shirts are an incredibly important part of our culture. 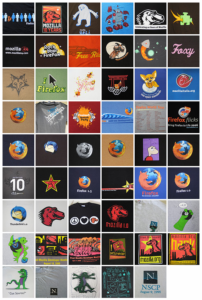 So, when Mary showed me a stack of classic shirts she’d collected from Mitchell, chofmann, Myk and others, I thought it would be fun to document all the Mozilla t-shirts throughout the years (with a few Netscape ones thrown in for historical context). If you want to see them up close, I’ve created a Flickr set of all the images. I’m quite sure that there are plenty of shirts I missed, so if you have one that’s not pictured here please let me know. I’d like this to be as comprehensive as possible. This is sure to be a constantly evolving thing…I know of at least four new shirts currently in development that will have to be added soon. So, enjoy this little look back through Mozilla history and stay tuned for future updates. 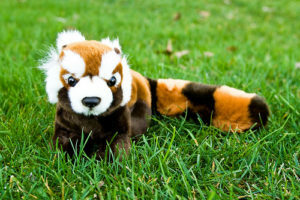 By popular demand, the long-awaited Firefox plushies are now available in the North American Mozilla Store. They’ll be in the International Store in about two weeks, at which point I will triumphantly close this bug. So, if you can handle this sort of cuteness staring at you all day long, head over the Store and get yours while supplies last. Also, thanks to everyone who voted in the poll and commented on the bug for helping to make this happen. * The good thing about the International Store is that Mozilla fans will be able to have their gear shipped to almost any country around the globe. The bad thing is that the world is a big place and shipping costs can get pretty expensive (especially when you factor in duties and taxes in certain places). We’re currently looking into a few grassroots solutions with some local Mozilla communities to combat this. I don’t have anything specific to report on this yet, but wanted everyone to know that we’re actively exploring ways to solve the problem.